Thanks to its ideal growing conditions and other factors, California grows more than 80% of the world’s almonds and accounts for 99% of domestic supply.1 This creates a comparative advantage, which in turn creates economic value, not just for farmers but for California as a whole, by creating jobs and strengthening the state’s economy. According to a study from the University of California’s Agricultural Issues Center, the California Almond community supports California’s economic well-being by generating more than 104,000 jobs statewide. Of those jobs, 97,000 are located within California’s Central Valley, the region where almonds are grown and an area that has long had a reputation for high unemployment.2 To put that into perspective, that's about as many people as General Motors employs throughout all of North America. 1. Almond Board of California and INC (International Nut and Dried Fruit Council). The Cracker. 2014. 2. University of California Agricultural Issues Center. The Economic Impacts of the California Almond Industry. December 2014. 3. University of California, Agricultural Issues Center. 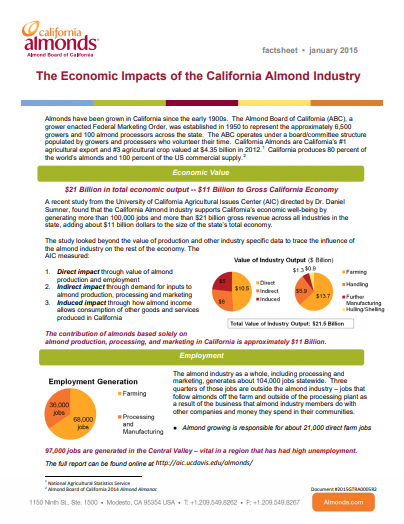 The Economic Impacts of the California Almond Industry. December 2014. 4. California Almond Sustainability Program. August 2017.